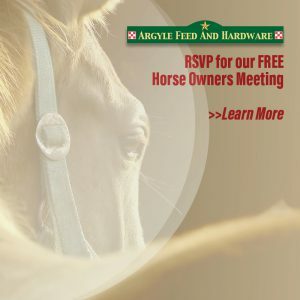 Join Argyle Feed Store for a Horse Owner’s Meeting on Tuesday, November 1st from 6 to 8 pm. We’re talking about how to winterize your horses and addressing some of the issues which could affect your horse’s health during winter weather. Get hands-on demonstrations that showcase Purina’s industry-leading innovation, quality and experience. Kaylan Herbst, our Purina Inside Sales Representative, will lead the discussion and provide information on assisting you with matching the right feed to meet your horse’s nutritional needs. Light dinner will be served plus we’re also offering coupons & giveaways! Don’t miss out on this opportunity to meet with your fellow horse owners and get great information about caring for your horses, Register for this FREE event below or call the store at (940) 241-2444 to reserve your spot. This entry was posted on Thursday, October 13th, 2016 at 4:47 pm	and is filed under Events, News & Updates. You can follow any responses to this entry through the RSS 2.0 feed. Both comments and pings are currently closed.